I like arty stuff but I’m no artist, I’m trying my very best to get all creative for Olivia’s sake and since I started all of this, I’m actually beginning to really like it. Pinterest inspires me, you’ll find everything and anything once you type in a word! So it being Easter Sunday in two day’s time I thought I’d do something to mark the occasion. The kids are off school, my kid doesn’t go to school yet but my niece and nephew do. So I got them around to my house to create a unique Easter gift for my parents that doesn’t involve chocolate. No, this gift will last a lot longer than chocolate. I found a poem online that seems to be anonymous and it was so simple and beautiful that I just had to share it. I know my parents will relate to this poem as they are very hands on with their three grandkids. We’re living in a time where grandparents play a huge role in helping to raise our children. Some of us are fortunate to have willing and able parents to look after our children while we go to work and my own parents do just that. 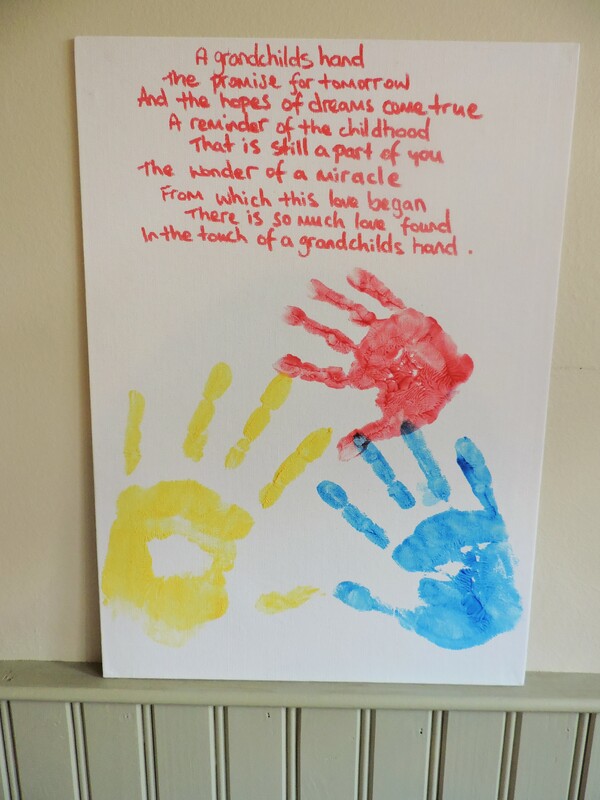 My sisters and I would be lost without them, we have a child each and they help us out so much, so I figured this poem would be a beautiful gift written out on an artists canvas with Sophie, Freddie and Olivia’s handprint painted onto it. 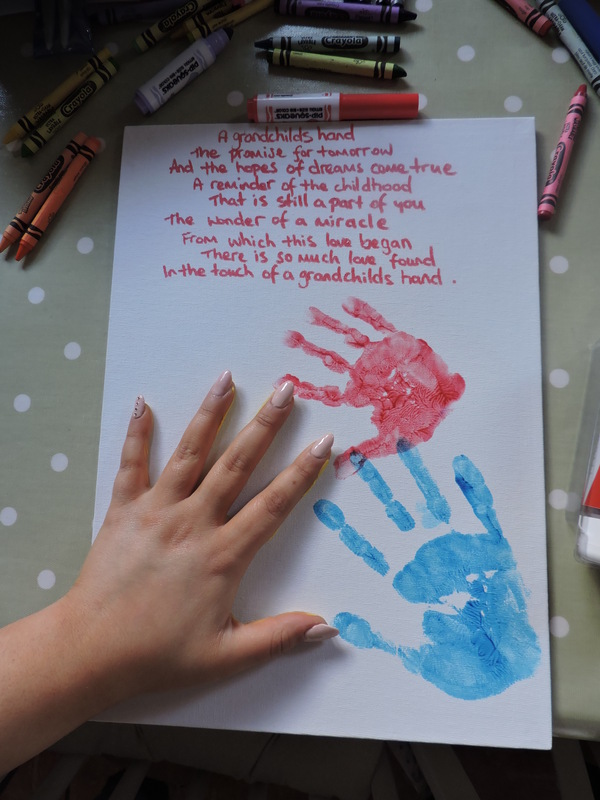 All you need is – Some finger paint, an artists canvas or some heavy card, some crayons to write the poem and some grandkids hands! If you like this idea, you just about have enough time to get it done by Sunday! The poem goes like this…. 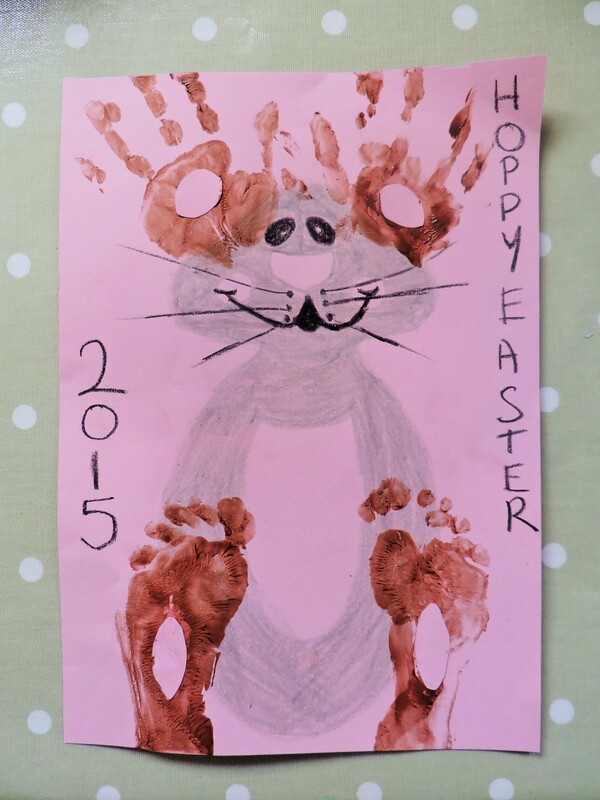 My next attempt at some Easter art is a cute bunny sitting on his bottom with toddler footprints for his paws and toddler hands for his ears. I drew the bunny a couple of times and what you will see next is my best attempt. Sorry in advance. 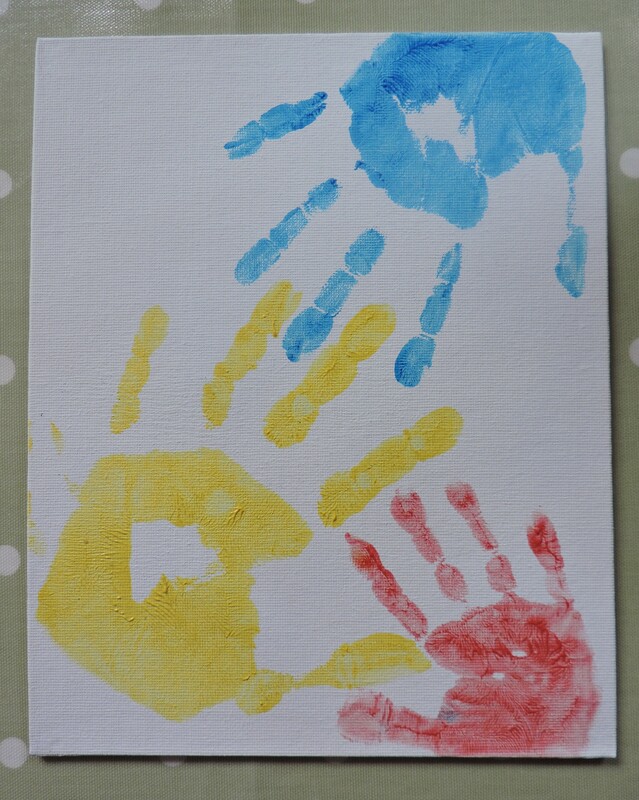 Olivia loved this too as she got to have her hands and feet painted. It was messy enough to do this and it was just myself and her at home so it was kind of awkward but we got it (just about) It’s a cute little picture to stick on the fridge. Simple and nice idea to save a piece of childhood!